Cosmetic & Restorative – John R. Lindeman, DDS | General and Cosmetic Dentist to Brevard County. Porcelain Veneers: The ultimate cosmetic tooth restoration. Porcelain veneers are bonded permanently to your teeth and can correct fractured or chipped teeth. Veneers also can align crooked teeth, eliminate gaps, and make your teeth white. The results with porcelain veneers are immediate and dramatic, and allow our patients to achieve their ideal smile in just two visits. Dental Implants: Dental implants are artificial tooth root replacements that are used to replace missing or lost teeth. Often the result is not only an enhanced smile, but also a more youthful appearance, since missing teeth can cause the face to collapse, making you look older. Dental implants also improve chewing, allow natural flossing and easy cleaning, and are completely decay resistant. They can be used to replace ill fitting partial or complete dentures to a completely natural feeling bite. Composite Bonding: When teeth are chipped, broken, discolored or decayed, they may be repaired with composite bonding. Dr. Lindeman uses a dental composite filling material to restore your tooth back to ideal health. Composites are sculpted into shape, contoured and hardened with a high-intensity light. The result is a restoration that blends invisibly with the remainder of the surrounding tooth structure and the rest of your natural teeth to create a healthy, bright smile. Crowns: When a tooth has been weakened by root canal therapy or deep decay, it should be covered with a crown. Porcelain crowns differ from veneers in that they surround the tooth 360 degrees. 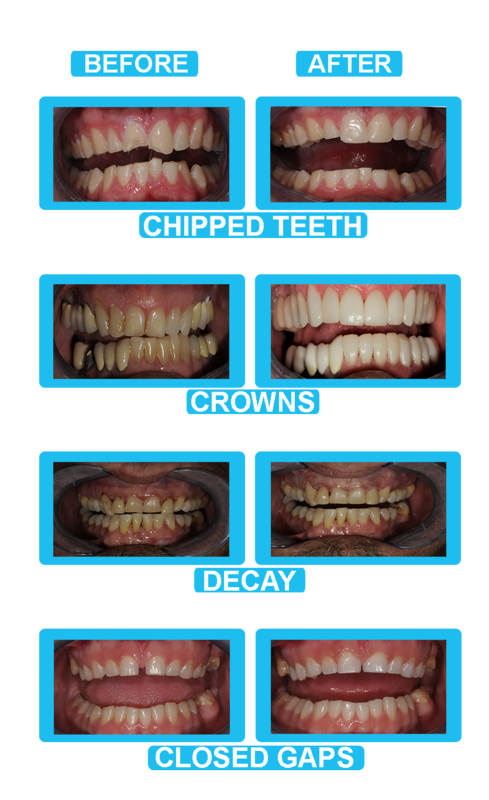 The porcelain now used for veneers and crowns is more cosmetically pleasing and stronger than ever. The objective in a crown procedure is to prepare the tooth to have an even taper from top to bottom. This shape allows the crown to slide onto and fit snugly over the tooth. Porcelain crowns can be made for the front teeth and back teeth. Occasionally, Dr. Lindeman will elect to do a gold crown for the very back teeth that get the most force of your bite. When you want the perfect smile, Dr. Lindeman offers patients a “Smile Makeover” which involves a comprehensive assessment of your smile aesthetics in order to improve your overall appearance. He will discuss with you your concerns and desired outcome. Typically, he will offer one or more cosmetic dentistry procedures, such as dental veneers, dental implants, orthodontics and teeth whitening to achieve that perfect smile.